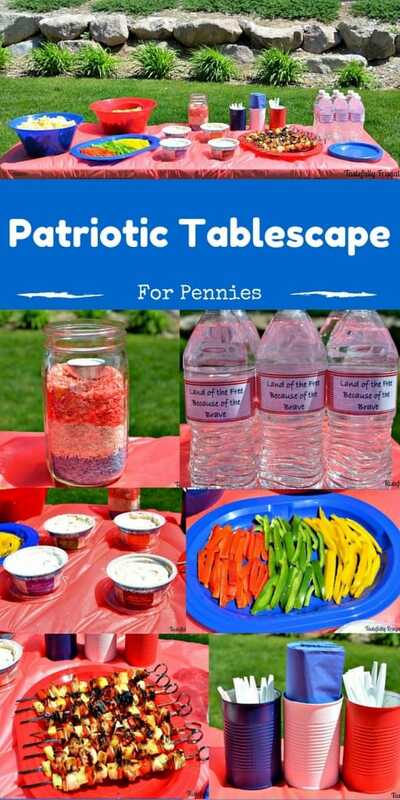 Create a patriotic tablescape in a just few hours and for pennies. Summertime is my favorite time of year! I love Christmas and Halloween too but the summer holidays will always have a special place in my heart; especially Memorial Day and Independence Day. There’s just so much more you can do when the weather is warm and they days are long. I normally like to plan big get togethers but being 5 months pregnant my energy levels just aren’t what that they used to be. But I can’t turn down a reason to get the family together so we are still planning a small get together for this weekend. I can’t go all out on the food or decor like I want to so I kept things simple and budget friendly. For the food we went with my new favorite, Sweet & Sour Chicken Kebabs and some tasty new dips. 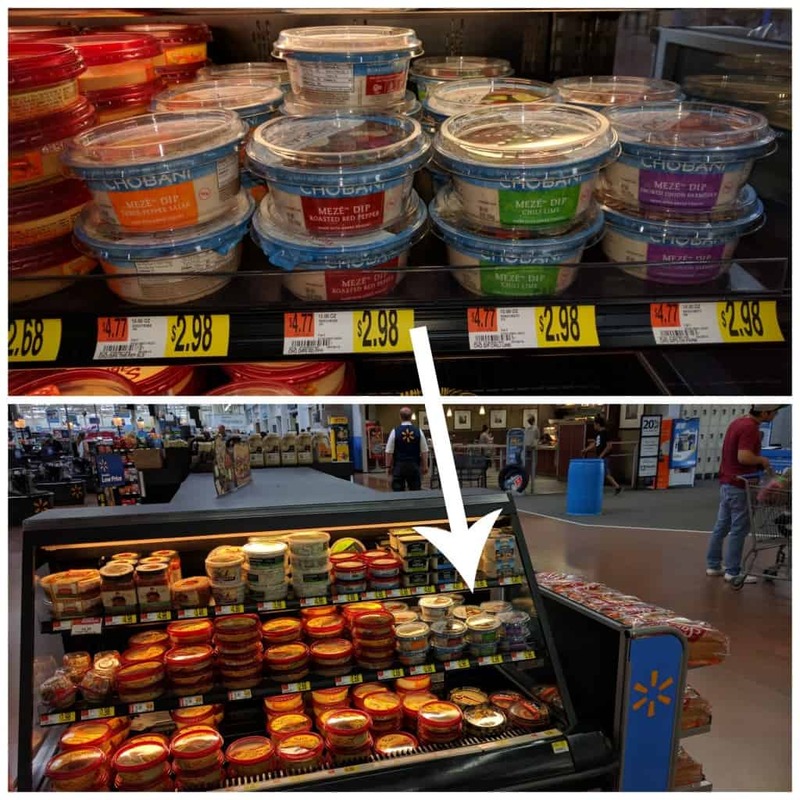 When I was at Walmart picking up chicken, pineapple and veggies for the kebabs I found these new Chobani Mezé™ Dips in the Deli section. The flavors all sounded amazing (Chili Lime, Roasted Red Pepper, Smoked Onion Parmesan and Three Pepper Salsa) and they are made with fresh vegetables and my favorite Chobani Greek Yogurt. And just like all of Chobani’s products they are made will all natural ingredients, which is really important to me. My boys loved the fresh food on the lids and insisted we get all 4. 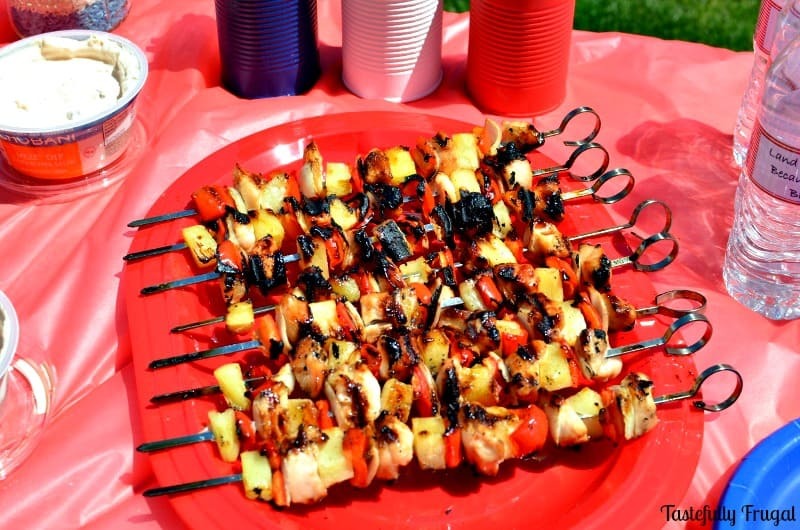 I was fine with that because they were a quick, easy and healthy addition to our Memorial Day party. 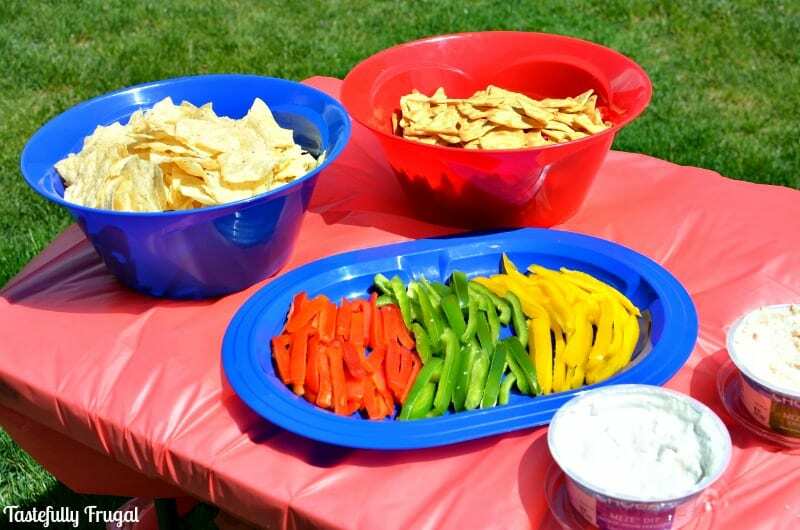 I also picked up some tortilla chips, pita chips and a few extra veggies to have with the dip. 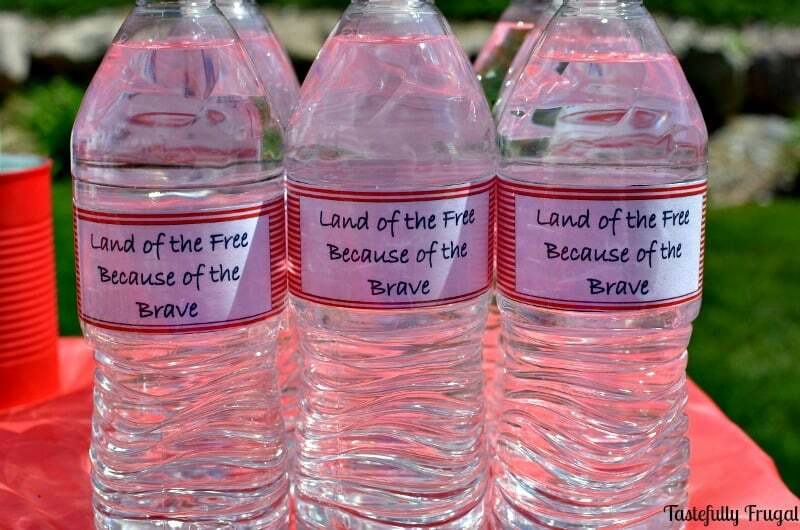 I’ve found with most of our get togethers that our friends and family tend to lean towards water over soda or punches when it comes to drinks so I picked up a case of water and added these fun water bottle labels to them. You can print yours here. Now on to the table decor. I love shopping for party decorations at Walmart because everything is so affordable. I picked up the tablecloth for $.97, and these big bowls for chips and the long plates for the kebabs and veggies were only $.88. 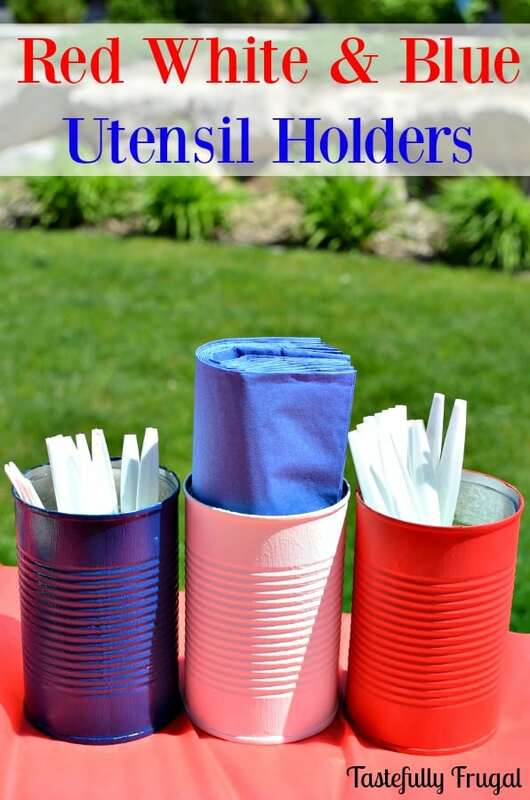 I wanted to do more than just put the utensils and napkins in a cup so I saved a few green bean and corn cans from dinner one week and made these cute utensil holders. Peel labels off of and clean cans. 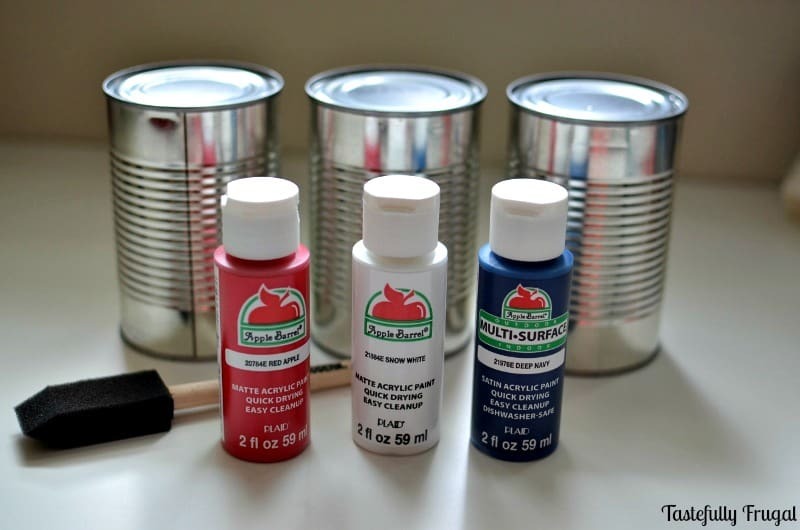 Paint cans with craft paint (one red, one white, one blue). Let dry for 30 min-1 hour. Paint a second (or third) coat if necessary. 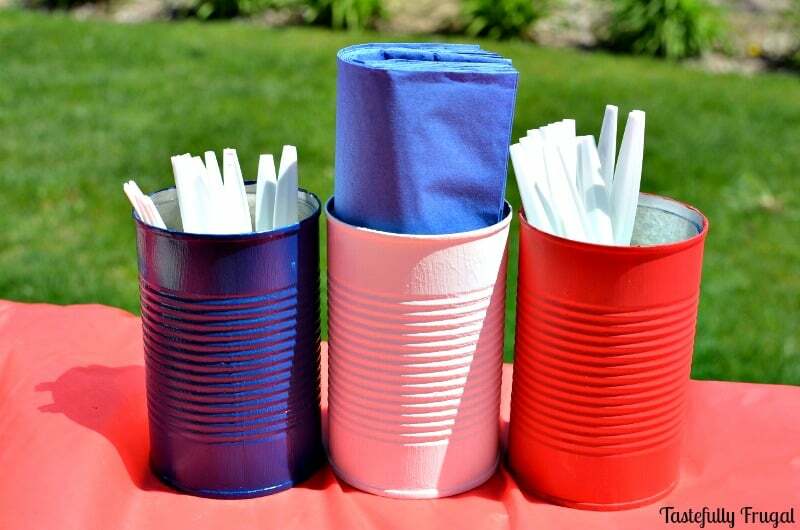 Place your forks, spoons, knives and/or napkins in the cans to keep them from being all over the table or blowing away. I also wanted to add a relaxing ambiance for when it started to get dark out. 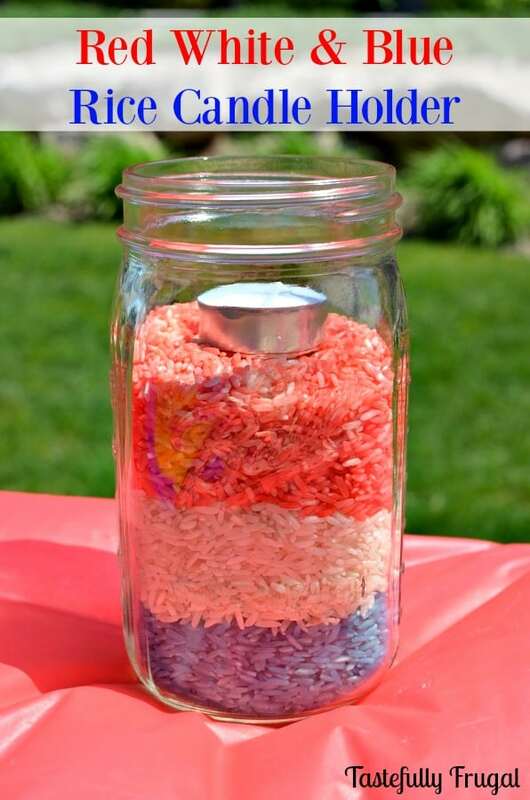 For the candle holders I had my boys help me and they had so much fun; how can you not have fun getting to squish together rice and colors together in a bag?! 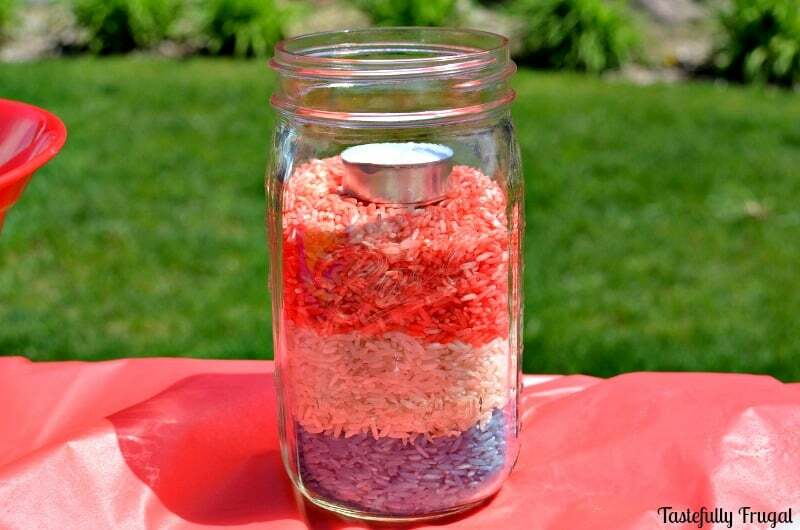 The candle holder only took an hour to make and the majority of that time was letting the rice dry. 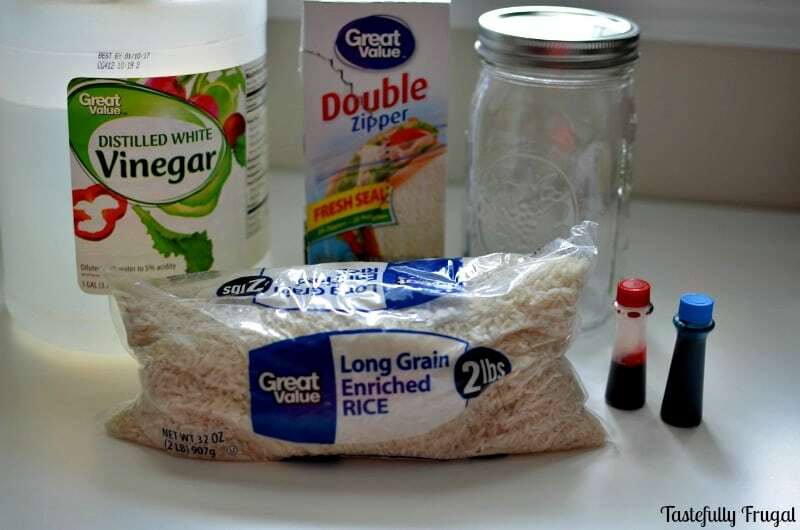 Pour one cup of rice into a ziplock bag. Add 10 drops of red food color and 1/2 tsp vinegar. Seal bag tight and shake to combine. Repeat steps with blue food color. Let sit for one hour to let dry. I spent less than $5 on the party supplies because I had the cans and supplies, mason jar and supplies, plates and utensils already and the food took less than 15 minutes to prepare. This is one party that I will be able to relax for before, during and after! What are you doing to celebrate Memorial Day? 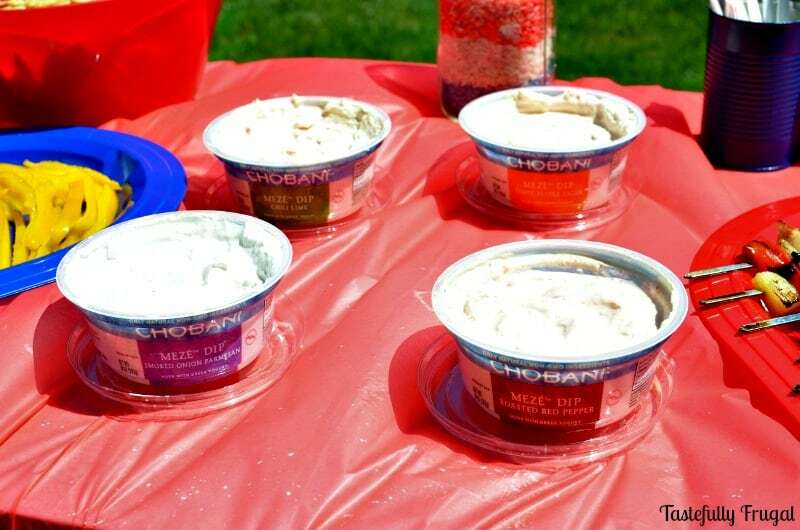 If you want to serve these tasty Chobani Mezè Dips for your get together head on over and print your $1 off coupon here before you go shopping!